On Monday night, the Town Planner updated the Planning Board and concerned residents about an alleged site plan violation at 144 Turnpike Road. Planner Karina Quinn told the board that the owner was taking actions to work out a solution. But the board unanimously agreed that the actions weren’t the right ones. As I reported in January, the board had developer William Depietri in to defend cut-through access he installed between his abutting properties at 144 and 154 Turnpike Road. 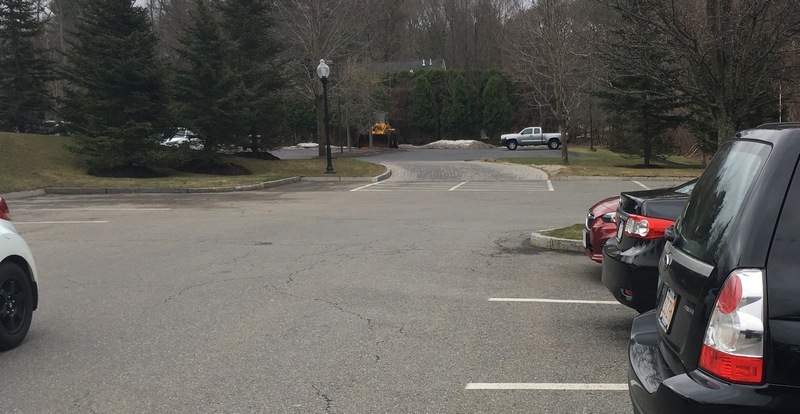 At the time, Depietri said the access was to provide easier access to Breakneck Hill road for tenants of the office park at 144 Turnpike Road. The Planning Board said that violated a condition of the Site Plan approval. The owner disagreed at the time and said he would wait for a ruling by the Building Commissioner. Following the meeting, the Building Commissioner sent a letter notifying Depietri that he was in non-compliance and giving him 30 days to act. It seems* that the action that Depietri took was to suggest an interim compromise while he applies for a Modication to the Site Plan. That suggestion was apparently prompted by a resident’s comment at the January Planning Meeting. During the hearing, neighbors raised concerns about safety issues caused by additional cars exiting onto Breakneck Hill Road at rush hours. But resident John Butler cited a safety benefit for Breakneck Hill Road during busy dinner hours. He said that the additional parking given to 154 Turnpike Road restaurant customers helped avoid cars parked on Breakneck Hill Road – something he witnessed last spring. He suggested a compromise might be in order where the access stayed while the cut-through traffic is prevented by barriers. 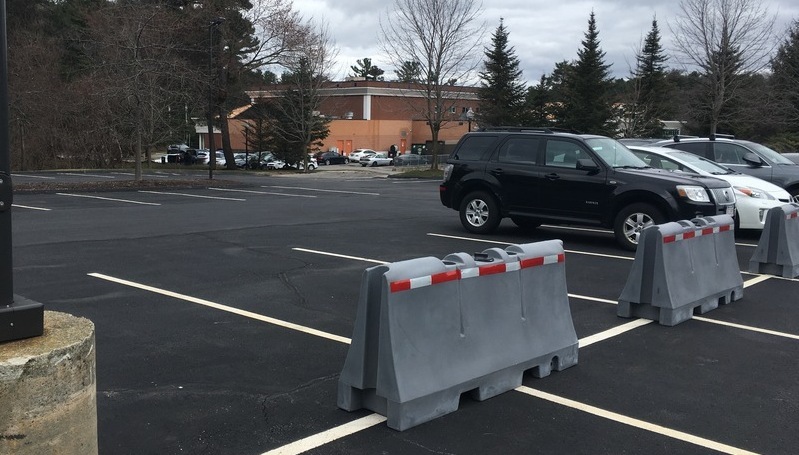 After receiving the violation notice, Depietri responded to the Commisioner with a plan to install temporary jersey barriers across a section of the 144 parking lot. (Click on the image right from the Planning Board packet, dated as a March 20th submission.) Quinn indicated that the proposed barriers was meant by Depietri to show he was doing something to resolve the situation. Quinn said that Depietri plans to apply for a Modification to the plan. Since there are public notice requirements for the hearing, she doesn’t expect that to take place until early May. In the meantime, she indicated that the Building Commissioner was going to allow the non-compliance to continue as long as the developer was working with the Planning Board on a solution. The Planner wasn’t sure what the modification application would request. Planning Board members were less than impressed. 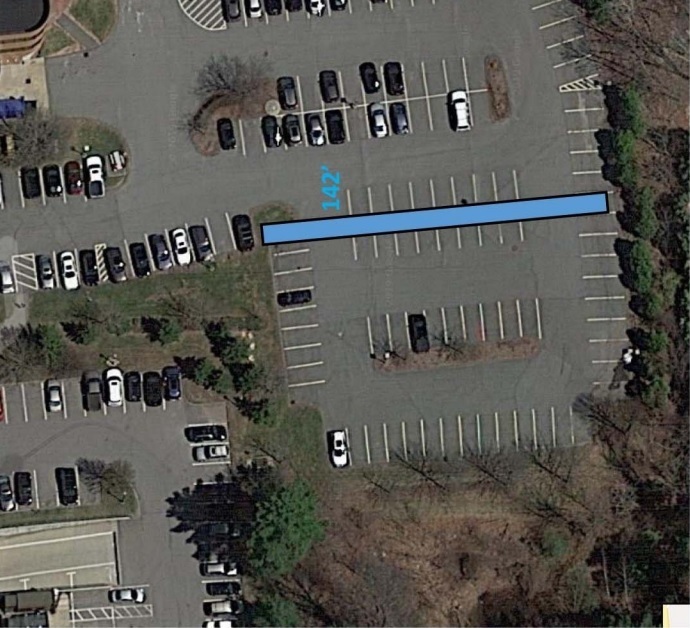 Each indicated that parking lot barrier doesn’t bring the site plan back into compliance. Member Andrew Mills suggested that the developer should place the barriers across the egress path he created between the lots. Stating that would only require 2 barriers, he pointed out that would cost the developer less money. As for parking capacity, Mills pointed out that the plaza hasn’t been making use of the underground parking lot as was originally intended when the site plan was approved. Other members said they agreed with his assessment. Member Jesse Stein said the image of the proposed barriers wasn’t a material gesture. He opined that until the property is back in compliance, the owner should be racking up daily fines. Stein believed they should be sticking to their code and process. Someone who wants to make changes should be applying in the proper way. Chair Don Morris said the proper thing to do would be to remove the pavers, replant the grass, return to original site plan and then apply for a modification. The chair also stressed that the board had no authority to approve a compromise measure. He said that until a proper application is filed, notice is posted, and a hearing is held in which the public can comment, the board doesn’t have the right to approve something different than the original plan. This chapter shall be enforced by the Building Inspector, as Zoning Enforcement Officer, as provided for in MGL c. 40A, § 7. No structure shall be erected, altered, demolished or moved and no land or structure shall be changed in use until and unless a permit has been issued. Any person violating any provisions of this bylaw, any conditions under which a permit is issued, or any decision rendered by the Board of Appeals or the Planning Board shall be punished by a fine not exceeding $300 for each offense. Each day that such violation continues shall constitute a separate offense. Based on Quinn’s report on Monday, it wasn’t clear if any fines had been charged and/or would be. Following the board’s comments, several neighbors again expressed upset over the situation caused by additional exiting cars and the way the owner went about the change. Depietri wasn’t in attendance, which irked at least one neighbor. Morris noted his attendance was immaterial and not required since the agenda item was just an update on the status. As of the Monday meeting, Quinn wasn’t sure if barriers had been place or when the developer planned to do that. Yesterday, I checked it out and discovered that the the egress between lots remained open and barriers were placed as per Depietri’s proposal. Click on thumbnails below to see enlarged image from around 11:30 am yesterday. I’ve been following this subject since it came up, I live directly behind the building. Unfortunately the barriers are not working, I saw a rather large dump truck towing a tractor off the property that went by the temp barrier with ease. I just drove by and saw that one of the barriers had been moved. They need to filled with water like they were designed to be so they cant be moved. As other residents have pointed out above, a process should have been followed and for whatever reason, was not. This owner is doing whatever he feels like with no consequence. The upshot is that the connection should be removed immediately. Generally speaking, do the rules, laws, and process apply to everyone else but not any one single developer? All developers are subject to the same process. That’s called fairness. The connection goes immediately and fines levied. That’s called enforcement. So – the building commissioner/building inspector has the authority to enforce fines for violating permit conditions and, we have a clear cut case of those conditions having been violated – for some time. Yet, for some reason (lack of enforcement?) the developer in question continues to thumb his nose at the town and its residents, erecting easily-moved plastic barriers. What does Mark Robidoux have to say for his conduct? And our tax dollars are paying him how much per year? Oh! Wait! The developer in question is Bill Depietri – you know, of Park Central fame? No I’m beginning to understand. What is going on in this town between developers and town ‘government’? You are behind on Building Commissioners. Mark Robidoux no longer works for Southborough. The current commissioner is Laurie Livoli. She was hired in December and began in mid-January.